This entry was posted in Uncategorized on August 31, 2015 by Gary. This entry was posted in Uncategorized on August 30, 2015 by Gary. This entry was posted in Uncategorized on August 29, 2015 by Gary. 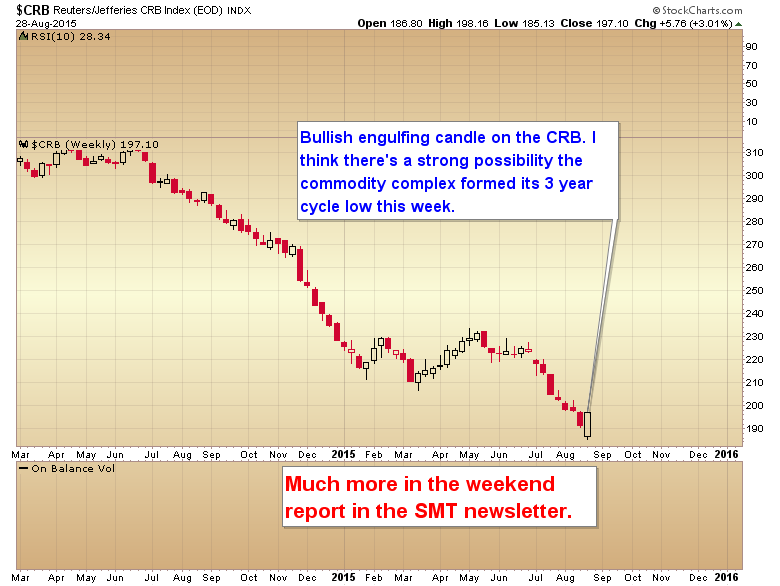 You won’t want to miss the weekend report. 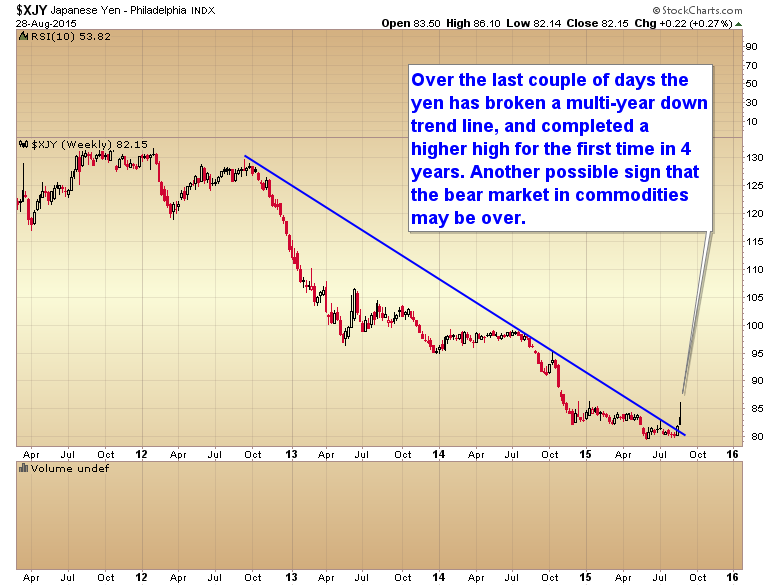 I think there has likely been a long term trend change that occurred this week. 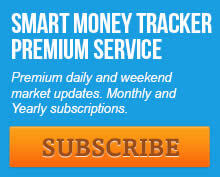 I explain in detail in tomorrows newsletter. This entry was posted in Uncategorized on August 27, 2015 by Gary. 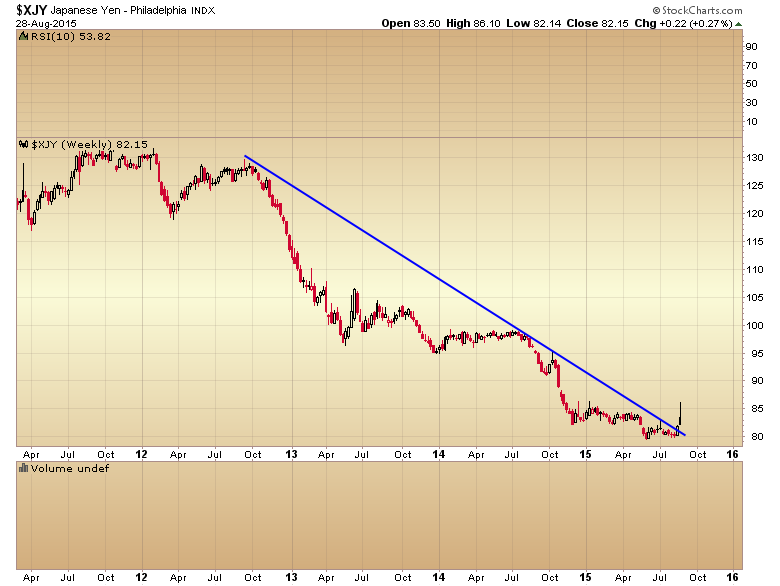 Stock portoflio is significantly outperforming the S&P. Up 7.7% for the year. The energy portfolio is positive 5% for the year but also taking a heavy drawdown as we wait for the 3 year cycle low to form. 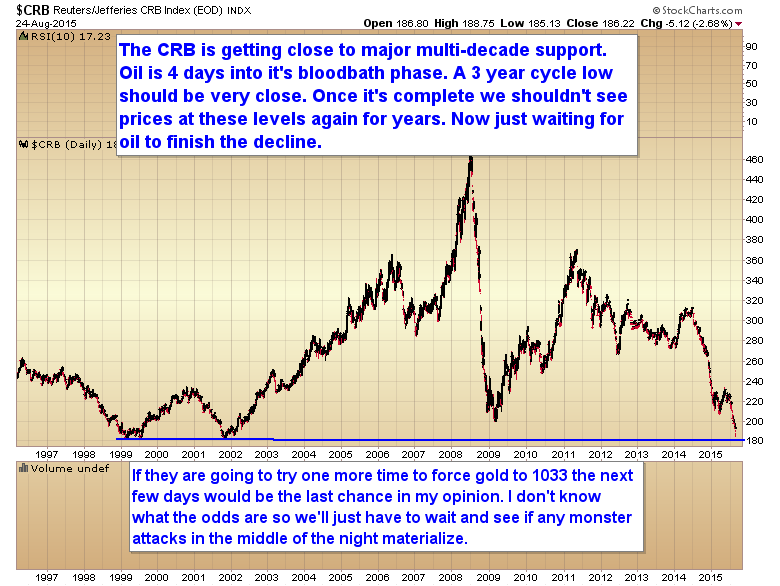 The Quest portfolio is up 200% but also taking a heavy drawdown while we wait for gold to form it’s daily cycle low. This entry was posted in Uncategorized on August 26, 2015 by Gary. 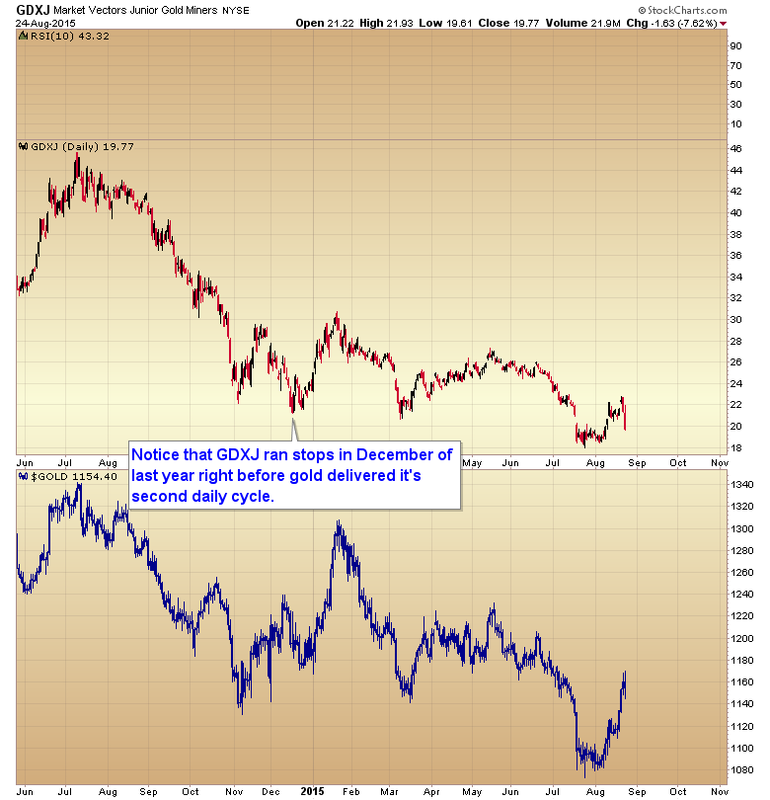 I want to take a special look at gold and the dollar this morning and see if we can’t alleviate some of the fears created yesterday by the big move down in mining stocks. As I’ve noted before it’s not uncommon for big money to try to run stops to enter at the cheapest price possible. We actually saw GDXJ run the stops last winter right before a second daily cycle tacked on some very big gains in the metals sector. 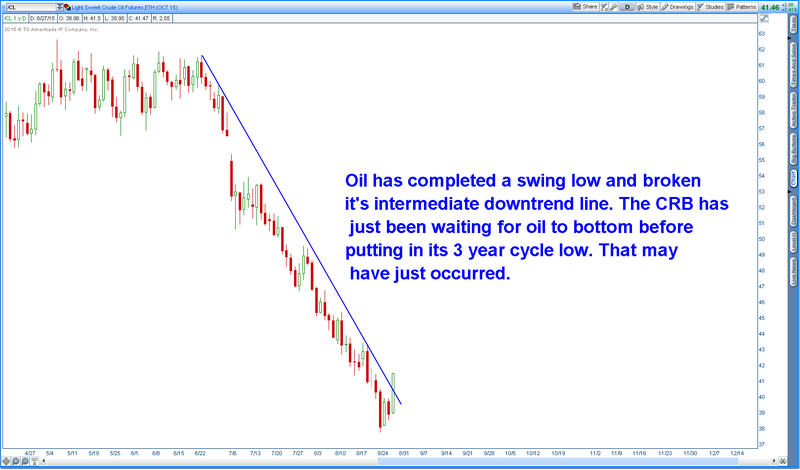 We may see that again in the mining sector over the next few days, possibly as oil puts in its final three-year cycle low. Now let’s take a close look at what actually happened over the last three weeks. 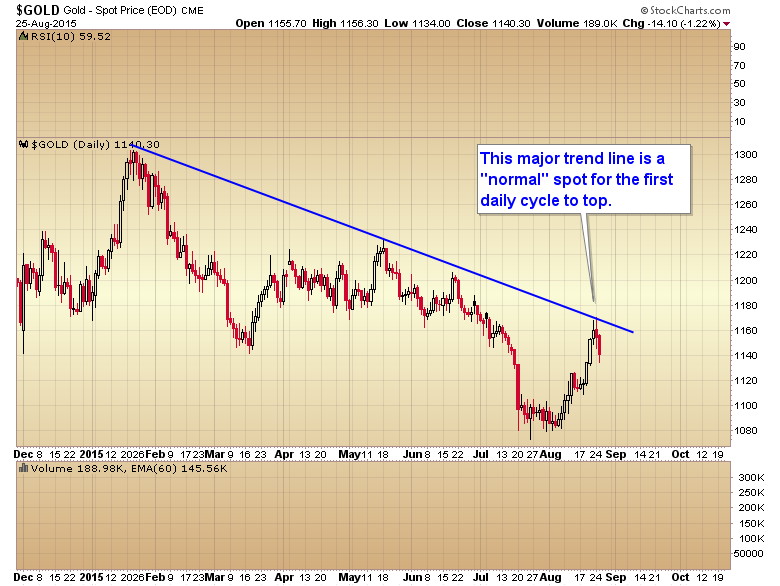 As you can see, as soon as the dollar started moving down into its daily cycle low gold accelerated into that V-shaped rally. 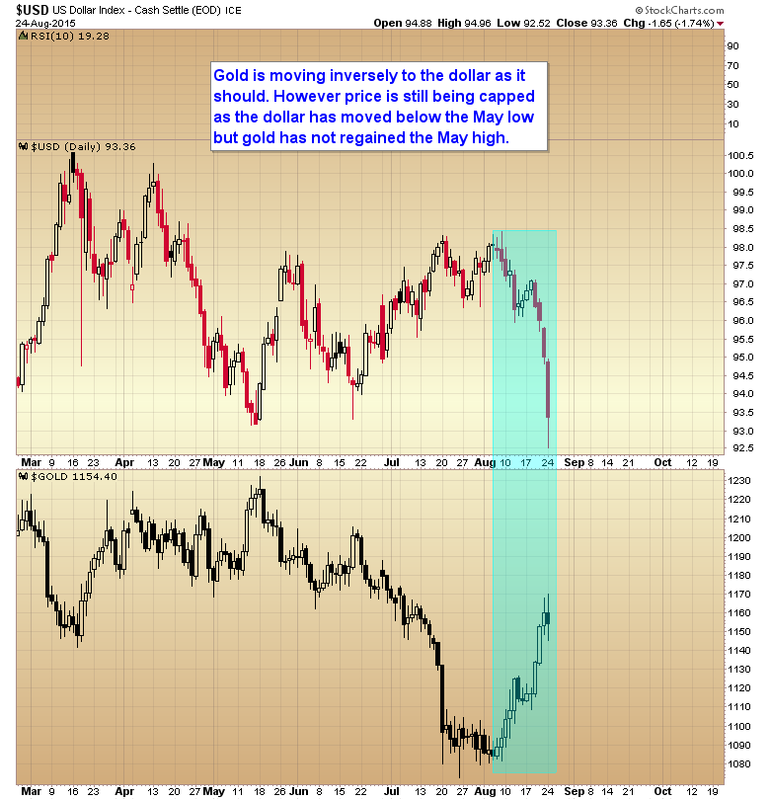 The discouraging fact is that gold is still being suppressed and even though the dollar is making lower lows below the May low, gold has been prevented from making a higher high above the May high. And of course we also have the attack on July 20th that forced gold below 1131 even though the dollar was not making a new high. 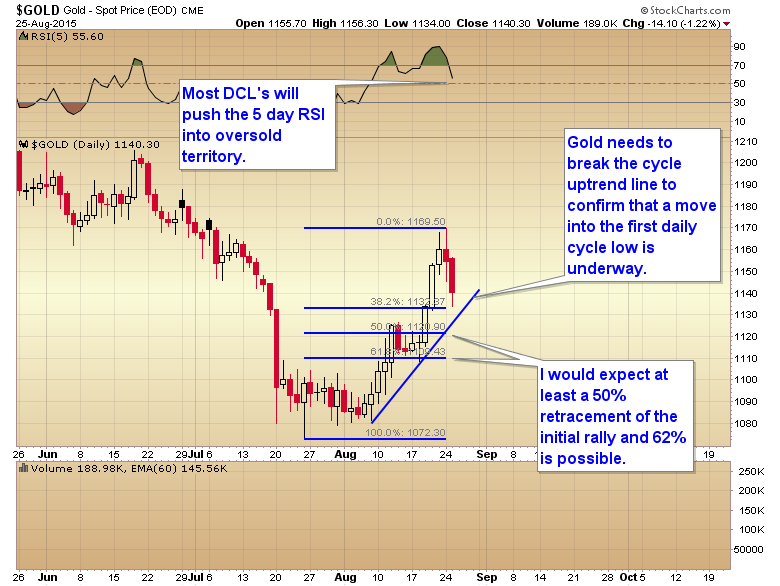 Obviously the powers that be are still trying to force gold down to the 1030 support zone. So it’s clear that gold is responding inversely to the dollar, as it should, even though it’s still being prevented from delivering the full potential of the rally. Realistically in an un-manipulated market without the July 20th middle of the night attack, gold would not have dropped below the 1131 support zone, and with the dollar making new lows, in a free market gold would be pushing above the May high by now. Until position limits start being enforced this is just something we have to deal with in this sector. 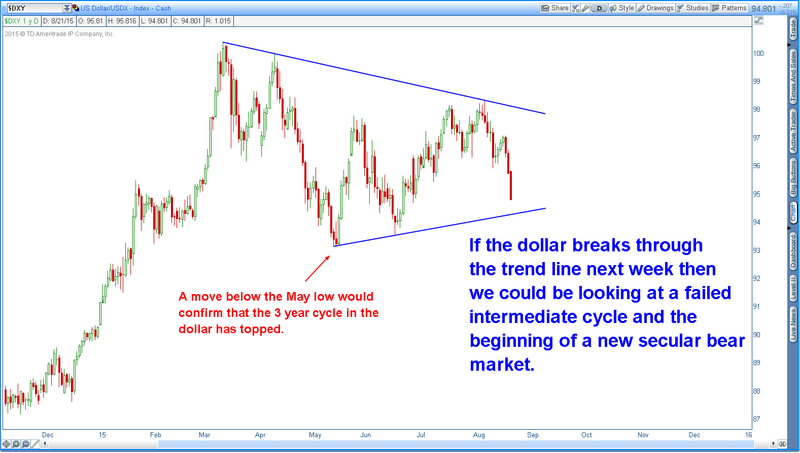 Now Let’s Look at the dollar cycle. 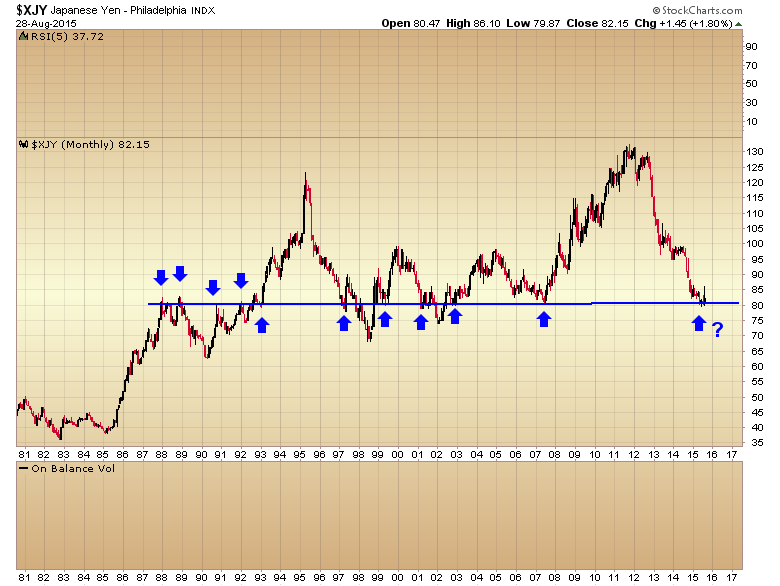 Technically the dollar is now in the timing band for a bounce out of a daily cycle low. That daily cycle low may have occurred yesterday although I wouldn’t rule out one more slightly lower low and a narrow range day to ease the parameters for forming the DCL. 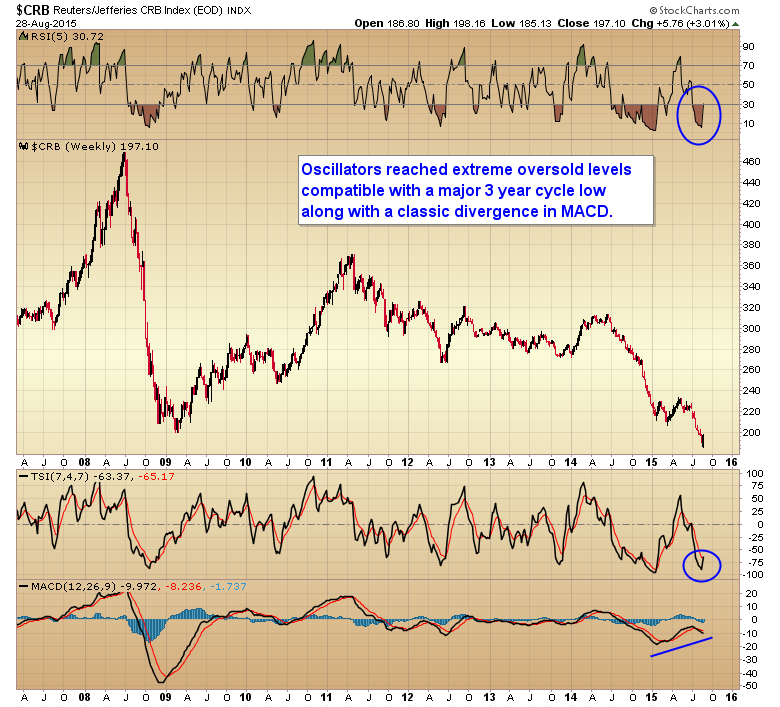 However as the intermediate cycle is only on week 15 it should still be too early for an ICL (intermediate cycle low). Plus I don’t see anything that looks like the typical bloodbath ending phase of a final ICL. So I think the dollar still has one more daily cycle down to go, and this should correspond with stocks dropping down into their seven-year cycle low in early to mid October. 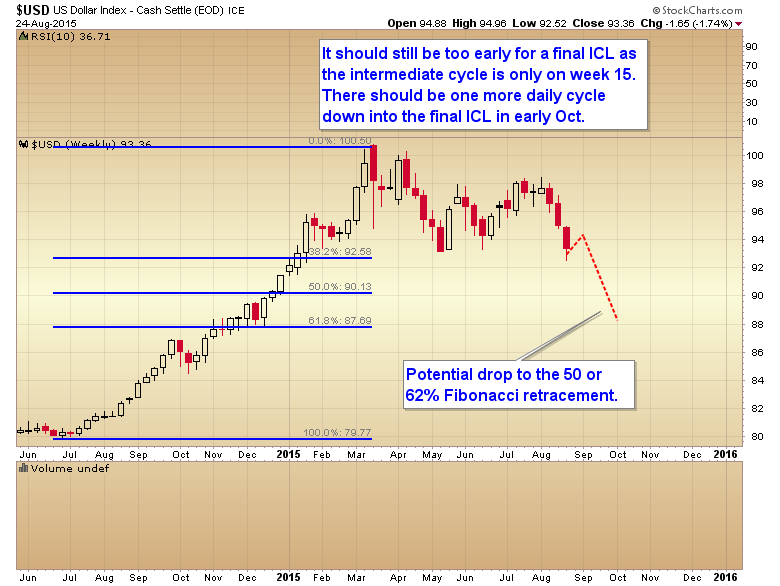 I’ve added in the Fibonacci retracement levels here to give you some idea of where I think the ICL could bottom. 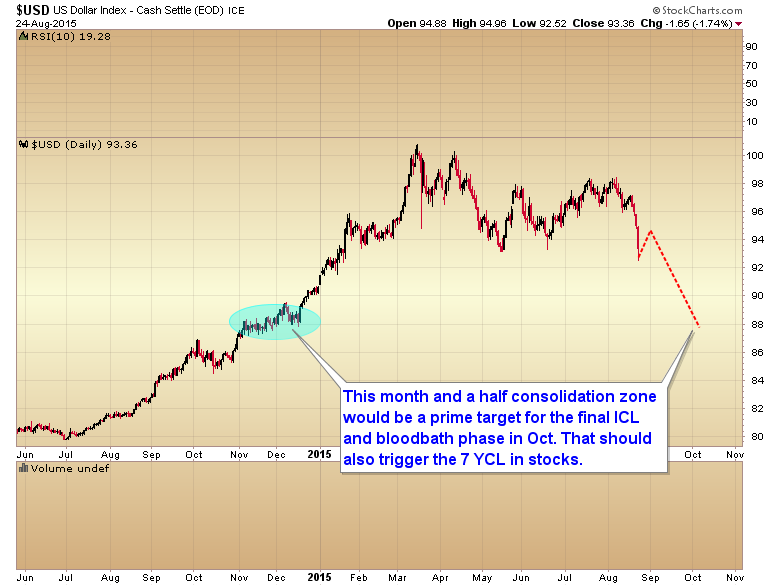 Now let’s turn to the daily charts and you can see there is a month and a half consolidation zone that in my opinion would be a prime target during one more daily cycle lower during a bloodbath phase ICL bottom. That consolidation zone falls at about the 62% Fibonacci retracement level. 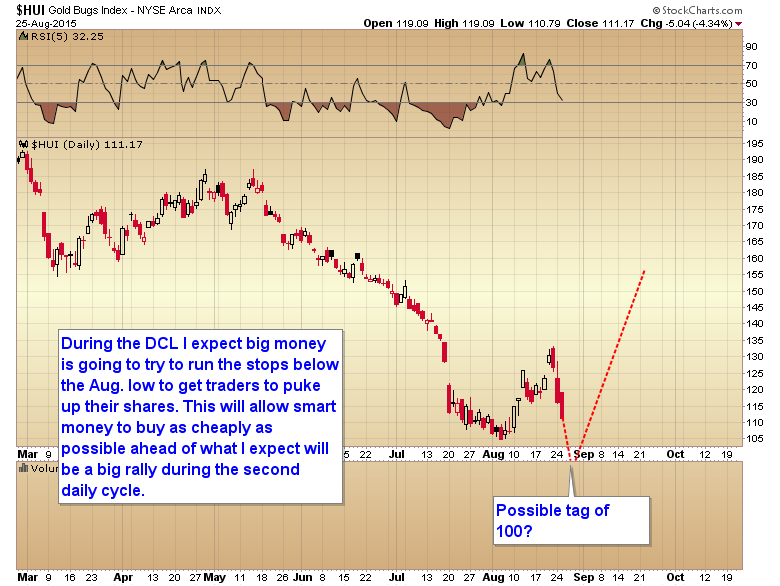 So as frustrating as it is to watch our gains in the miners evaporate as quickly as they were generated, I still think gold has a date with a very strong second daily cycle, and the dollar has a date with one more daily cycle lower and a big bloodbath phase decline into its next ICL. This would be the opportunity for gold to test that 100 week moving average at the 1250 level and I expect miners would play catch up and generate a very aggressive rally during the next daily cycle, even if they were to first run stops similar to what happened to GDXJ last winter. So we may be in for a frustrating few days ahead as the dollar bounces and gold works its way down into its daily cycle low. 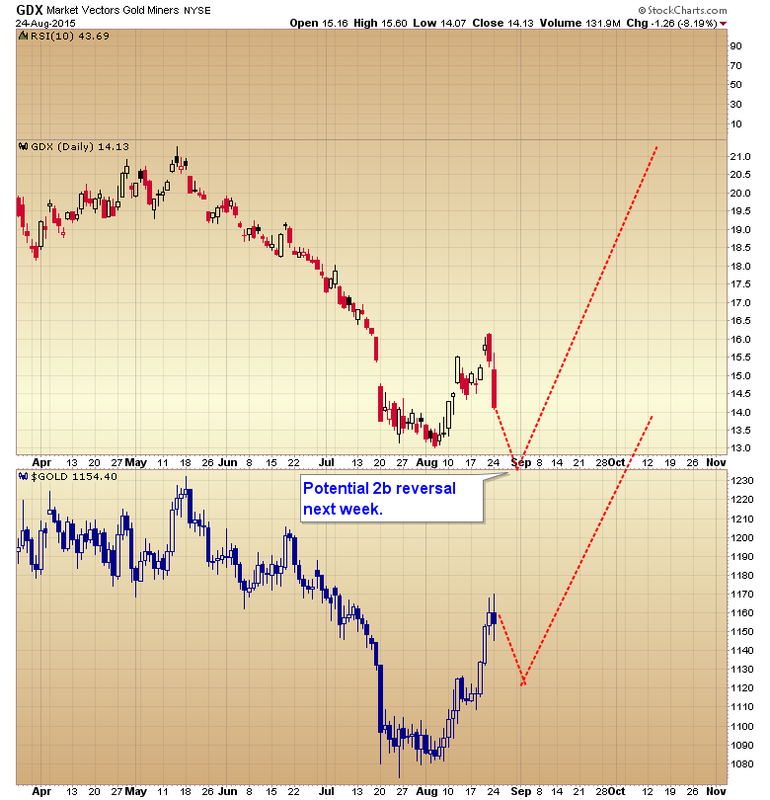 But once those moves are complete, and all of the late arrivals have been knocked off I think we are going to see a very aggressive rally, especially in the mining sector. One that is likely to make the 24% rally during this first daily cycle look rather tame. 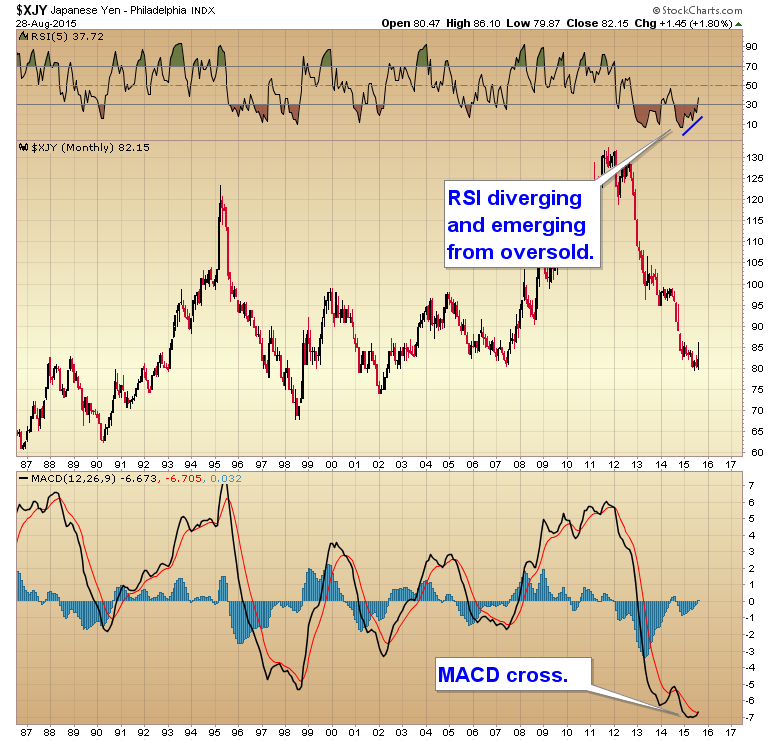 For those that missed the initial bottom, I think you are about to get a second chance. This entry was posted in Uncategorized on August 25, 2015 by Gary. 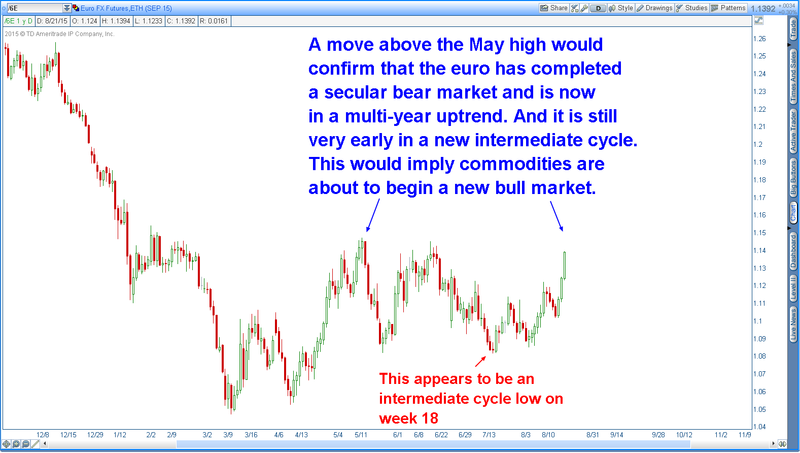 It seems like everyone has become convinced that the dollar is going higher and the euro is going to parity…myself included. I’m starting to wonder if everyone is 180 degrees wrong on this thesis. This entry was posted in Uncategorized on August 23, 2015 by Gary.